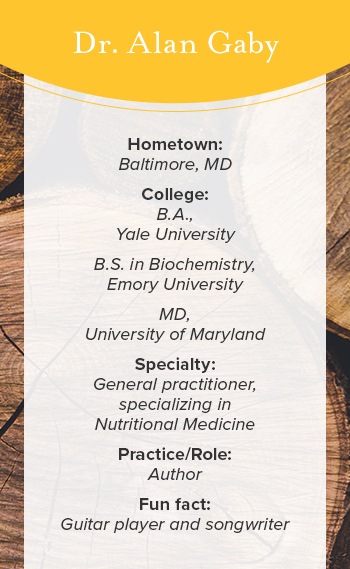 Alan Gaby, MD, received his undergraduate degree from Yale University, his Masters of Science degree from Emory University, and his medical degree from the University of Maryland. Working in private practice for 19 years, he served as President of the American Holistic Medical Association and gave expert testimony to the White House Commission on Complementary and Alternative Medicine on the cost effectiveness of nutritional supplements. He is the author of The Patient’s Book of National Healing, Preventing and Reversing Osteoporosis, The Doctor’s Guide to Vitamin B6, as well as numerous scientific papers in the nutritional medicine field. In 2010, Dr. Gaby completed his thirty year project, a textbook titled Nutritional Medicine, which has recently been published in its second edition. Question: What makes nutritional medicine such an important part of medical practice? Dr. Gaby: What’s important about nutritional medicine is it offers an effective, inexpensive, and low-risk approach to preventing and treating hundreds of different conditions, including most of the common conditions that plague Western society. Conditions like heart disease, osteoporosis, high blood pressure, arthritis, depression, and fatigue, to name a few. All of these can be prevented or treated effectively to some extent with dietary and/or lifestyle modifications and nutritional supplements. The most common approach that patients experience in the conventional medical system is medication, which frequently does nothing more than cover up symptoms, and which can cause numerous dangerous side effects. People remain in the system in this model, often not feeling well, and costing insurance companies or their own pockets a lot of money. Nutritional therapies are frequently effective for these conditions, and it can lower the cost of care and make people healthier. However, patients are often unaware that nutritional therapy is an option, or of what questions to ask. Let’s talk about your book on this subject, Nutritional Medicine. Why did you feel there was a particular need for this book? I felt it was important that the healthcare community have an accurate and scientifically-based guide on how to use this treatment approach. Historically, nutritional medicine has been quite controversial. On one side, conventional medicine has denigrated, misrepresented, or ignored the entire field. On the other side, there have been instances of excessive hype, where people exaggerated or drew unwarranted conclusions from the research. My goal was to analyze the research objectively and, in combination with my personal clinical experience, present an unbiased overview of what works and what does not, and how to use nutritional therapies safely and effectively. So that’s what I did. Over the past 44 years I reviewed research from the present, all the way back to 1900, collecting and analyzing over 50,000 studies related to nutrition. I also saw about 6,000 patients over a 19-year period, before retiring from patient care to work full-time on the textbook. The first edition of Nutritional Medicine was published in 2011, and the updated second edition was released in 2017. With 342 chapters and over 16,800 reference citations, the book is being used in 32 different countries and is required or recommended reading in many integrative medicine, naturopathic, chiropractic, dietetic, and nutrition courses. Can you give us a brief overview of the latest version of the book? The first part discusses general principles and the second part focuses on individual nutrients and how to use them safely and effectively. The remainder of the book looks at individual disease conditions and how to prevent and treat them with dietary modifications and nutritional supplements. It’s designed to be very specific, teaching practitioners and the general public alike to be aware of what options there are. It takes the stance that nutritional therapy can be an effective approach to healthcare, but requires proper training. What’s your reaction to the term “alternative medicine”? People who practice good medicine are looking for the safest and most effective therapies. I don’t consider myself a practitioner of "alternative" medicine. When I was seeing patients, in a large majority of cases the most effective treatments turned out to be dietary modifications and nutritional supplements. I would like to think that I was practicing "good medicine." Giving it a label like “alternative medicine” emphasizes the fact that it is currently outside of the mainstream. Rather, we should reverse the question and ask mainstream doctors why they do not include these effective, safe, and inexpensive treatments in their practice. Conventional medicine has frequently labeled these approaches as unproven, which is not true. What I’ve learned over the years is how much research there is out there that supports nutritional medicine. When I started looking at this in 1973, there was already enough evidence to support the belief that diet and nutrients can be used as a primary treatment modality. Since that time there have been thousands of additional studies that confirm the idea that this approach should be one of the main components of modern medicine. I don’t want to disparage people who are doing conventional medicine - they’re trying to help people like we all are. They use the tools that they have, but many of them are just totally unaware of this field. They read review articles in conventional medical journals that are often biased against nutritional medicine, and they have not had access to this information. Many previously conventional doctors, after becoming aware of the research on nutritional therapies, have changed the way they practice. What would you say to a patient who wants to explore this sort of treatment but is concerned about cost? In my book I quoted one of my medical school professors who was a conventional doctor. He had a great deal of wisdom, and one of the things he said was, “The better trained you are, the fewer tests you will need to order, and the fewer medicines you will need to prescribe.” The same is true of nutritional medicine. If you have a well-trained practitioner, they can often come up with a treatment plan that does not require expensive laboratory tests or expensive supplements. My philosophy is that, whenever possible, you should use the gentlest therapy first. You don’t want to waste people’s money doing tests that may or may not be useful, or have them take a shopping bag full of supplements when they might do just as well with a simpler regimen. On a societal level, you can argue about Obamacare vs. Trumpcare. But, unless we incorporate cost-saving interventions into the mainstream, healthcare costs will bankrupt us, regardless of who is paying for it. On the positive side, the American Board of Physician Specialties is now offering board certification for integrative medicine. That means mainstream medicine has finally recognized that this treatment approach has value, and that one needs to be adequately trained in order to practice integrative medicine properly. Your life’s work is in this book. As you reflect on this huge accomplishment, is there a specific point that you are most proud of?